Jessp Griptape is the original griptape manufacturer for the skateboarding community, and has a multi-generational presence in action sports. They approached our group with the goal of re-branding their product line with a new, fresh, but still authentic look. 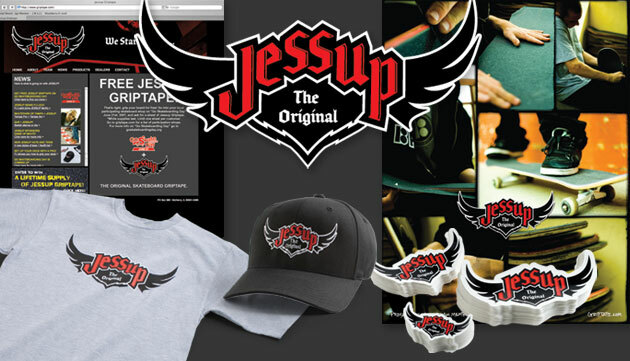 We devised a short and a long-term marketing plan for Jessup that included re-activating their brand by designing a new logo and website, as well assembling a new skateboard team. Our work together has help put Jessup on the path of “Category Killer” for the worldwide skateboard griptape market. Some of the specific marketing strategies that we implemented for Jessup included enlisting skateboard pro PJ Ladd, (part of the “Super Team” at Plan B skateboards) whose name and image brought instant recognition and credibility to the Jessup Griptape brand. We also created a mass e-mail program, comprehensive ad campaign, direct mail piece series, and tied Jessup into event sponsorship, which helped them capitalize on core skateboarding promotional opportunities. The entire marketing effort was unified, tied together with design, and timed to work strategically with sales efforts.